Meat, meat, meat, if you like really good quality meat, then Blacklock is for you. 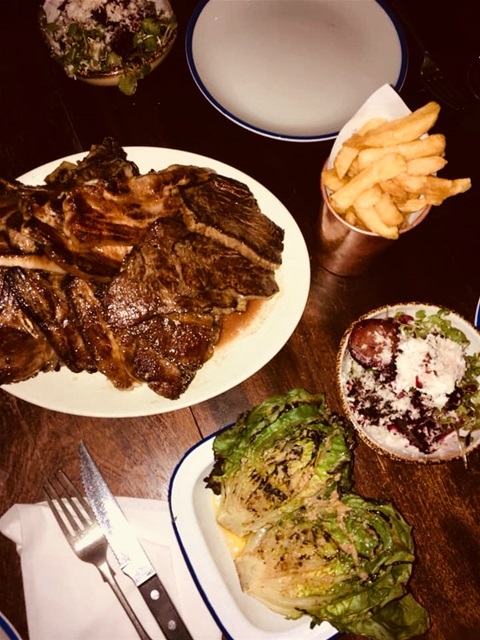 With an almost hidden entrance (originally an old Victorian Soho brothel) on great windmill street, keep your eyes peeled or you will miss it but once inside the atmosphere and ambiance is lively and fun with a buzzy canteen feel. Offering a more modern take on the Traditional Great British chophouse, with meat apparently sourced from the best award winning West Country providers in Cornwall, you’re in for a quality meal and all cooked over a real charcoal grill (try the mixed combination started plate as well, a tasty and fun way to start your main meal). Prices are good too, food is reasonable and the Cocktails start from a fiver, they even do wine on tap! It’s all geared up to provide simple top quality food and an overall pleasing atmospheric chop experience and it did. Blacklock Sundays are also good for those hearty Sunday Roasts at very reasonable prices.